Srinagar: Prime Minister Narendra Modi today spoke to Jammu and Kashmir Chief Minister Mehbooba Mufti and offered all possible support in dealing with the flood situation in the valley. "Spoke to J&K CM @MehboobaMufti on the flood situation in the state. Offered all possible support from Centre in dealing with the situation," he tweeted after his discussion. PM Modi reached out to Mehbooba at a time when Jammu and Kashmir is facing a flood threat, with Jhelum being in spate. Though the water level in river Jhelum and it's tributaries started to recede this morning, after rainfall stopped last night, easing fears of a flood in Jammu and Kashmir. 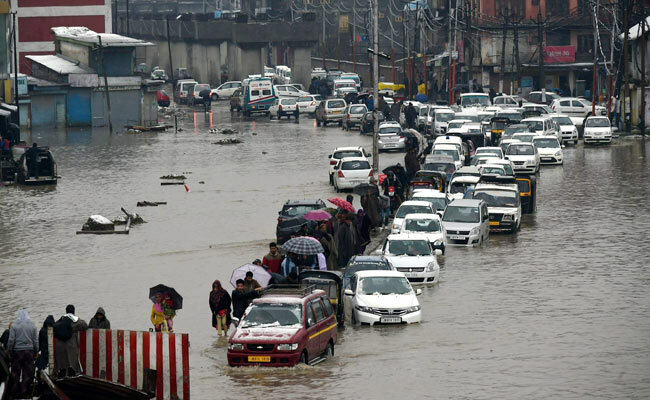 The water level in Jhelum started to recede at around 3:00 am at Sangam in South Kashmir, however, the situation in Srinagar hasn't improved much, officials said.